Company Profile | TDS Co., Ltd.
TDS Co., LTD. is a specialized producer of Solenoids that are actuators to convert electrical energy into mechanical linear motion. Solenoids can be applied into various products including information equipment, office equipments, optical equipments, automobiles and the related equipments, audio devices. Solenoids are widely used for almost any electrical devices. Over 2100 types of solenoids are manufactured by TDS Group with the monthly capacity over 8 million units that is the Japan and world top class capacity as a Solenoid dedicated maker. Supplying TDS solenoids over 300 of widely recognized customers in various fields makes TDS brand widely accepted and trusted. Company Name TDS Co., LTD.
Enlarged map for TDS Head Office. Drive 1.2km and TDS building is on the left. 1. Go straight from Okaya JR Station toward North East. 3. Go straight at the next intersection and drive into Prefectural Route 13. 4. Turn Right at the intersection “Honcho 1Cho-me” and drive into Prefectural Route 14. 5. Turn Left at the intersection “Honcho” and drive into Prefectural Route 254. Drive 1.4km and TDS building is on the right. Feb. 1962 Takahashi Manufactory was founded in Narita-cho, Okaya-City in Nagano prefecture and started coil winding for small transformer coils. May. 1967 The factory relocated to Imai, Okaya-city and started DC solenoids manufacturing. May. 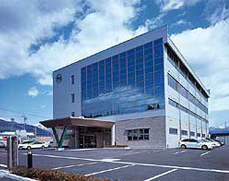 1969 New factory was built in the current head office address, Shimei-cho, Okaya-City and the old factory moved in. Oct. 1969 Takahashi Manufactory was re-organized into joint-stock company with the capital of 5million Japanese yen. Dec. 1971 Ina-Takahashi Electronic Ltd. was established in Ohgaya, Nishi-minowa, Ina-City in Nagano prefecture. Apr. 1975 Company was renamed to Takahashi Electronics. Established structure for DC Solenoid specialized manufacturing. Sep. 1981 Ohnodai Electronics was founded in Akiwa-cho, Kita-Akita-gun, AKITA. Jun. 1983 Ani Electronics was established in Kamikoani-mura, Kita-Akita-gun, AKITA. Sep. 1983 Kamikoani Electronics was established in Kamikoani-mura, Kita-Akita-gun, AKITA. Dec. 1983 Company merged Ina-takahashi Electronics Ltd. into Ina factory. Apr. 1984 Takahashi Machinery was moved from Okaya-City to Kita-Akita-gun, AKITA. Jun. 1984 Gojohme Electronics was founded in Gohohme-cho, Minami-Akita-gun, AKITA. Jun. 1986 Company had its 12th capital increment to the total capital of 16 million Japanese yen. Jun. 1987 Corporate combined the head office manufacturing function into Ina-factory to rationalize the operation. May. 1992 Takahashi Electronics (Thailand) was established in Thailand. Sep. 1993 Takahashi Electronics (HK) was established in Hong Kong. Jul. 1994 TDS Manufacturing was established in Dongguan, China. Apr. 1995 Company was certified to ISO9001. Oct. 1996 Company was renamed to TDS Co., Ltd.
Nov. 1996 Company increased its capital to 20million Japanese yen. Feb. 1999 TDS Manufacturing was certified to ISO9002 in China. Aug. 1999 Trademark of TDS Co.,Ltd was registered. Jan. 2001 TDS Manufacturing 2nd factory was constructed and operated as a cutting operation factory. Feb. 2002 Company acquired capital in YAGINUMA Co.,(Hong Kong) Ltd. to be included in TDS Group. Mar. 2002 Company increased its capital to 22.5 million Japanese yen. May 2003 To increase the capacity, TDS Manufacturing first factory was moved into the larger factory in the region. Yaginuma Manufacturing China Press department was also moved to Haihao Industrial Zone to establish integrated manufacturing system with TDS Manufacturing China. Mar. 2004 T.D.S. (Hong Kong) Ltd. Increased its capital to HK$ 2.5million. Apr. 2004 TDS Thai factory production was transferred to TDS China factories to integrate oversea production sites. Oct. 2005 Company merged TDS AKITA Co., LTD into AKITA Factory. Jan. 2006 TDS Co., LTD Technical Center (Head Office) was constructed. Apr. 2006 ISO14001 (2004) was certified to TDS Co., Ltd.
Apr. 2011 Yaginuma Co., (Hong Kong) Ltd. was merged into T.D.S. (Hong Kong) Ltd.
Jul. 2011 TDS Manufacturing China took full ownership and established T.D.S. (DONG GUAN) Ltd.
Oct. 2011 T.D.S. (DONG GUAN)Ltd.　absorbed YAGINUMA(DONG GUAN) that was renamed to T.D.S. (DONG GUAN) third factory. Apr. 2013 Newly built T.D.S(DONG GUAN)Ltd.the 4th factory to expand the production of solenoids relating to the automotive. May. 2013 Converted into wholly-owned with the transfer of Yaginuma manufacturing, and established T.D.S ELECTROPLATING(DONG GUAN)Ltd.
Sep. 2015 Built and addition to Akita factory to expand solenoid & coil production capacity. Jun. 2016 Established TDS LEON MEXICO, S.A. DE C.V. in Silao city, Guanajuato state, the United Mexican States. The capital is 2.2 million US$. Aug. 2016 Established TDS（VIETNAM）CO., LTD. in Ha Nam province, the Socialist Republic of Vietnam. The capital is 4.5 million US$. Apr. 2017 TDS LEON MEXICO, S.A. DE C.V. Increased its capital to 3.0 million US$.